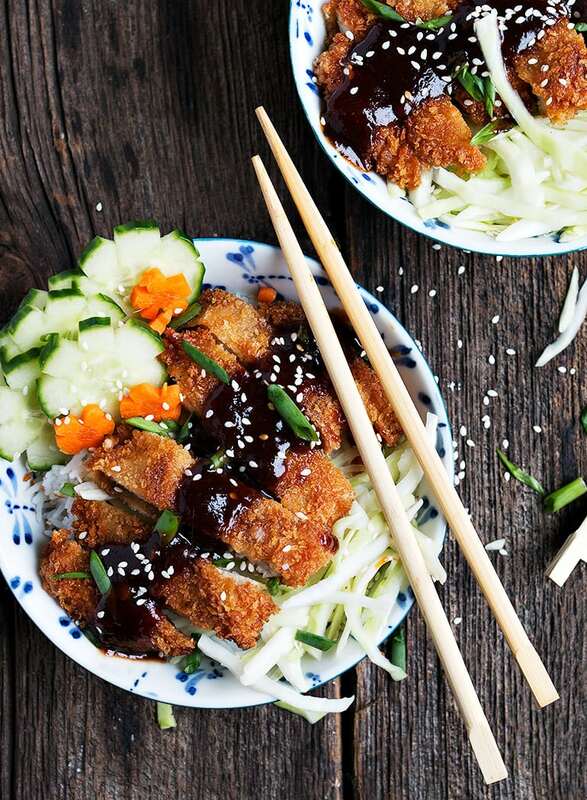 These Pork Tonkatsu Bowls are a quick, easy and delicious meal in a bowl. With panko breaded pork cutlets, topped with homemade Tonkatsu sauce, rice and fresh vegetables. 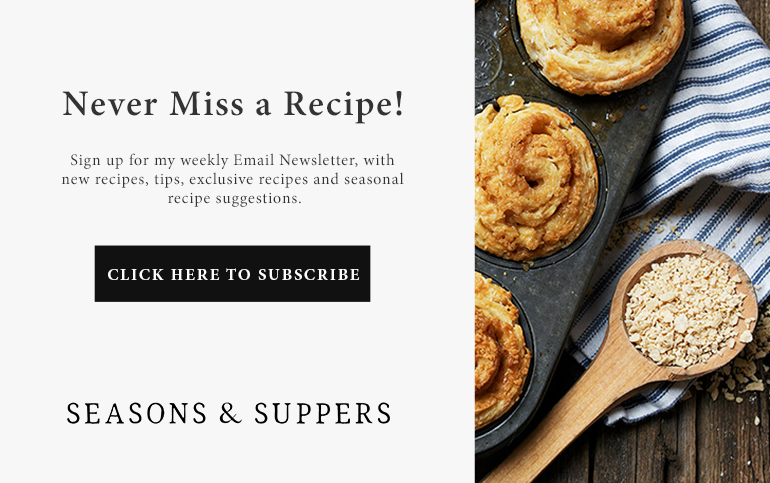 As I mentioned in my most recent newsletter (you can sign up here), I’m sharing 3 new recipes for fast fry pork loin cutlets this week. You know, those thin, boneless pork loin pieces that are often on sale, but we always wonder what to do with them. 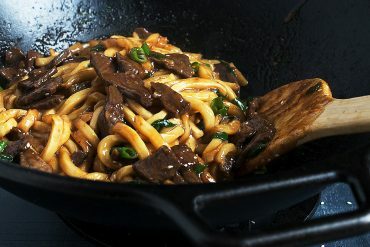 Check out the second recipe in this mini pork cutlet series, this 20 Minute Spicy Pork Udon Stir Fry. 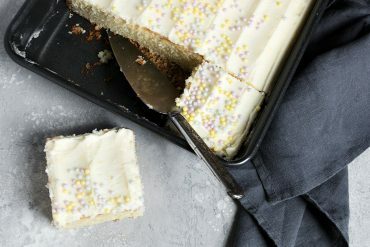 This first recipe is a favourite of mine. I was first introduced to katsu at my local Japanese restaurant. You may be familiar with Katsu, which is a breaded chicken cutlet. When made with pork, katsu becomes Tonkatsu (a combination of the word for “pig” and “katsu”). 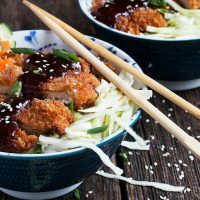 Tonkatsu is often served with a Tonkatsu sauce, which is super easy to make at home with common ingredients. While you can eat Tonkatsu on it’s own (on a plate, with maybe rice and a veg), I sometimes like to make a bowl of it, placing it on top of the rice and adding some fresh vegetables to the mix. I’ve used shredded cabbage here (quite traditional with tonkatsu), along with some fresh cucumber and carrot slices. Inspired by how my local restaurant pretties up their vegetables, I did a little easy vegetable cutting before adding to the bowl. You don’t need to do that, but if you’d like to, instructions are in the Cook’s Notes below. If you are new to Tonkatsu, let me assure you that beyond the bit of soy sauce that the pork is dipped in, what we have here is basic breaded pork. On it’s own, quite ordinary and kid-friendly, too. You could easily just enjoy the breaded pork and skip the sauce if you prefer. For the prettied up vegetables: For the cucumber, simply cut a 3 or 4-inch piece of seedless cucumber. Using a sharp knife, cut out a wedge (by cutting in a “V” shape) in the sides from end to end. Cut 5 or 6 thin wedges out around the entire outside. Then slice your cucumber into slices as usual. For the carrot, do the same, making smaller wedge cuts around the outside, before slicing into thin slices. *Safety tip! Safe knife practices mean we should always try to cut with the sharp edge of the blade moving away from us. So make your first cut of the “V” with the sharp edge pointing away, then flip the cucumber or carrot piece around, so you can make your second cut in that same (away from you :) direction. When it comes to frying up the breaded pork, I always reach for my mid-sized nonstick frying pan. Using a non-stick pan that’s just big enough for the job, means I need to use very little oil to fry. I literally just add enough to make a thin layer over the bottom of the pan. Want to enjoy Tonkatsu in another form, too? Try my Tonkatsu Sandwiches! Perfect for picnics. 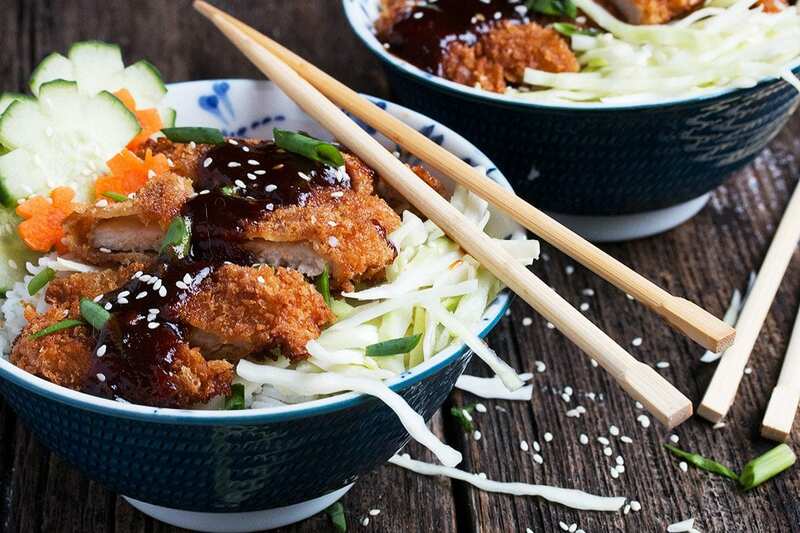 Quick, easy and delicious, this is a your entire meal in a bowl, with breaded pork, homemade Tonkatsu sauce, rice and fresh vegetables. To make the Tonkatsu sauce: In a small saucepan, stir together the ketchup, Worcestershire sauce, sugar, soy sauce, mirin, garlic, ginger and mustard. Heat over medium-high heat and stirring regularly, bring to a boil. 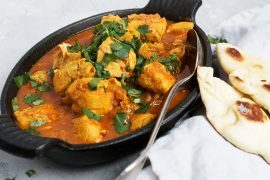 Reduce heat to low and simmer until sauce is reduced by about 1/4 (7-8 minutes). Let the sauce cool and refrigerate, if making head or, keep warm if you will be serving immediately. 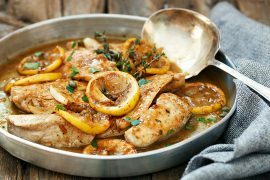 (Sauce can be made ahead and refrigerated for up to 1 week). Prepare 4 plates. On one plate, combine the soy sauce, garlic and half of the salt and pepper. On another plate, whisk together the flour and the remaining salt and pepper. On the third plate, whisk together the eggs with the water. On the last plate, add the panko crumbs. Add one pork piece to the soy sauce plate and toss to coat. Next, dip it into the flour mixture to coat. Shake off excess. Dip into the egg mixture, letting excess drip off. Dip into panko crumbs, patting to coat evenly. 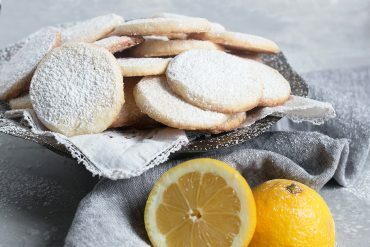 Place on a wire cooling rack. Continue until all the pork pieces are breaded. In a non-stick skillet just large enough to hold all your pork, add oil until it just covers the bottom of the skillet in a thin, even layer. Heat oil to just a bit more than medium (but not all the way to medium-high). 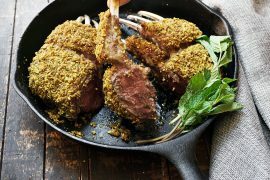 When hot, add the breaded pork to the skillet and cook until the underside is golden, then flip and fry the other side until golden. Remove to a cutting board. 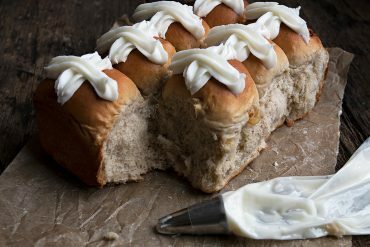 Allow to a couple of minutes while your prepare your bowls. Fill bowls with hot cooked rice. Add some cucumber and carrot slices to one side and some shredded cabbage on the other side. When pork has cooled slightly, cut cooked pork pieces crosswise into 3/4-inch wide strips. Place pork slices in the centre of the bowls. 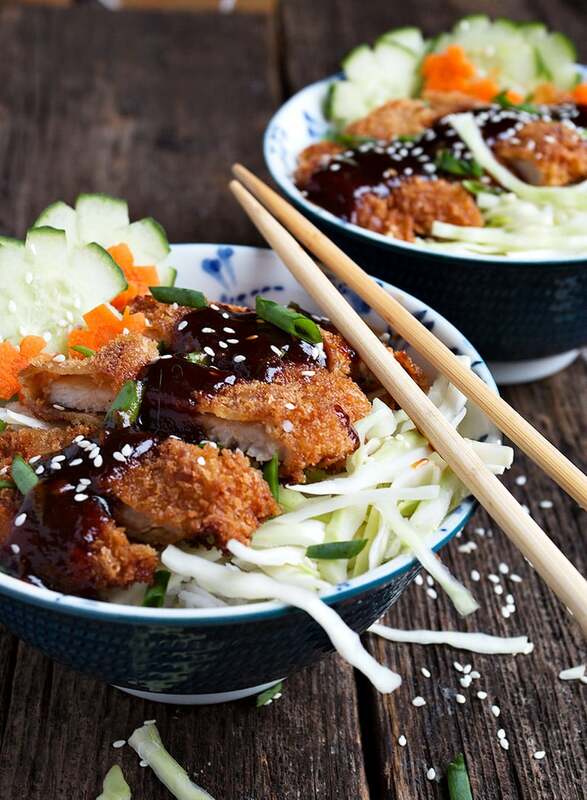 Drizzle with some warm Tonkatsu sauce and garnish with some sesame seeds and sliced green onion. So glad you tried it and enjoyed it! This is one of my favourite dishes :) Thanks! 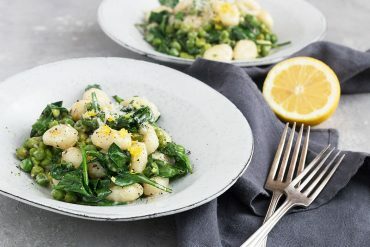 This looks like a super delicious, perfectly casual, fresh and easy dinner entreé! Pinning for future reference! Such a pretty and easy bowl. I am a huge fan of katsu style fried meats and this tonkatsu is beckoning with that delicious sauce you whipped up! This one is going on the table for my husband – he loves pork like this and I think that sauce has my name on it. Beautiful dish that sounds super tasty! Yes. I’m always wondering what to do with that kind of pork Jennifer! And what a delicious idea. I’ve never heard of this, but looks like I’ve been missing out. On my list. Love those pretty cucumbers too! Saw on this on IG and had to check out, of course! I love pork tonkatsu and everything about this! This needs to happen ASAP! !